Eagle Ridge is in Gilroy, California, a city located at the southernmost tip of Santa Clara/Silicon Valley. Gilroy and its surrounding countryside is blessed with beautiful mountains, award-winning parks, and an abundance of places for leisure activities. Eagle Ridge has more than 1,000 acres of open space (take a photo tour of Eagle Ridge to see just how beautiful it is! ), and the area around Eagle Ridge and Gilroy is rich in things to do, see, and experience. Only 15 minutes from the heart of Gilroy is Mount Madonna Park, covering 3,200 acres and featuring some of the finest Coastal redwood trees. Also nearby is Henry Coe Park, the second-largest State Park in California (more than 88,000 acres) and Adams-Chitactac Park an original settlement of the Ohlone Indians. Gilroy is also one of California's "other Wine Country" areas, with vineyards and several wineries producing premium wines within minutes of the city. The wineries of Hecker Pass (Highway 152) and nearby Watsonville Road not only offer perfect places to taste wine, picnic, and relax, but spectacular views of rolling hills and ancient redwoods and oaks, as well. Check out the local wineries. 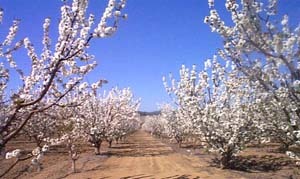 In the springtime, local orchards bloom with the beauty of apple, cherry, apricot, pear, and other fruit trees, while the bright yellow of delicate mustard flowers cover the countryside. In summer and autumn, local fruit and vegetable stands offer the fine produce that has made Gilroy famous for almost a century and a half. Contact Gilroy Visitors Bureau at 408-842-6436 for a free Country Crossroads Farm Trails Map, which shows you how to get to some of the farms and farm stands that offer their fabulous produce. For a breathtaking view of incredible flowers, visit Goldsmith Seeds' spectacular garden on the west side of town, just a couple of minutes' drive from Eagle Ridge, on Hecker Pass Highway (Highway 152). For a family experience that's both fun and educational, check out Bonfante Gardens Theme Park, which features the world-famous Circus Trees, as well as rides and attractions. An ostrich ranch? That's right. The Silver Oaks Ostrich Ranch in Morgan Hill has many of these amazing birds, which can be as tall as 8' and weigh 400 lbs.! Telephone the ranch at 408-778-6271 for more information. 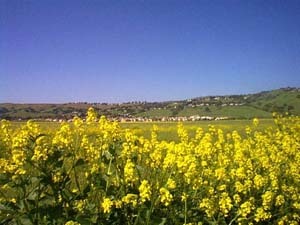 You can find out more about Gilroy's parks at http://www.ci.gilroy.ca.us/parksdoc.html. There are several golf courses in the area, including Eagle Ridge Golf Club. Check out our list of golf courses and online resources. For history and aviation fans, there's the Wings Of History Air Museum in San Martin, just a few minutes' drive from Gilroy. The museum houses a 1903 Wright Flyer, World War I replica planes, and Golden Age aircraft along with vintage engines, other aircraft, artifacts, and models. Of course, if Gilroy is famous for anything, it's world-renowned for its annual Gilroy Garlic Festival, held the last weekend of every July. However you like your garlic, you can be sure that you'll get your fill during the festival's three days. There's also entertainment, as well as arts and crafts, all held in Gilroy's beautiful Christmas Hill Park, just minutes from Eagle Ridge. For updates on these and other activities and attractions in the Gilroy area, check with the Gilroy Visitor's Bureau. This site designed by Tom Mulhern & Associates. If you have feedback or questions regarding this site, contact webmaster@mulhern.com.